NEW YORK (CNNMoney) -- Exxon Mobil wants to tell you something: It pays taxes. A lot of them. In the first months of this year, Exxon (XOM, Fortune 500) says it paid $3.1 billion in taxes in the United States -- more than even the $2.6 billion in profit it made selling oil and gas. To get to that number, the company includes the federal and state gasoline taxes that the company collects from drivers and passes on to government coffers. It also includes payroll taxes the company pays on behalf of its employees. The company is highlighting its overall tax contributions to make a point: It wants Americans to see just how much the company and its activities add to the overall tax rolls. "We are one of the largest taxpayers in the United States," said Alan Jeffers, an Exxon spokesman. For Exxon -- and the oil industry overall -- the message is urgent. Led by President Obama and key Democratic lawmakers, Congress is pushing to eliminate $4 billion a year in tax breaks enjoyed by the oil industry. With gas at $4 a gallon, it's not a popular time for politicians to defend oil industry subsidies. Even some top Republicans have recently suggested they might support eliminating the breaks. 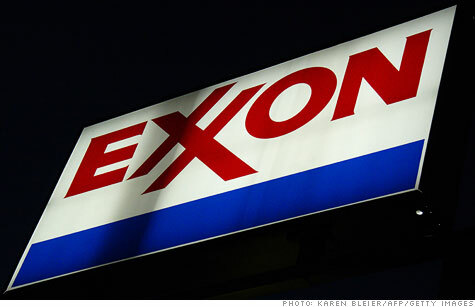 Critics say Exxon Mobil and the industry is going too far in making its argument. Throwing in those seemingly superfluous tax figures seems like an unnecessary move, especially considering that even without them the income tax the company pays is pretty high. Exxon's average effective U.S. income tax rate over the last six years is about 29%, according to the firm's security filings and an interview with a top Exxon tax lawyer. It's one of the highest rates for any industry. Jeffers said the company highlighted its overall tax contributions because it's important for people to see just how much the firm and its activities add to the overall tax rolls. Exxon's income tax rate is below the 35% rate mandated by corporate tax law, but it's widely believed most U.S. companies don't pay that rate thanks to generous loopholes in the tax code. The loopholes are designed to let U.S. companies compete with their foreign counterparts, which often have a lower corporate tax rate. Jeffers noted that Exxon's tax bill can fluctuate wildly from year to year. In 2008 the company paid over 35% of its profit to the government, while in 2009 it was near zero due to an overpayment from the year before. In 2010 it was about 18%. Tax Justice Center's McIntyre said his own calculations show Exxon's tax rate over the last three years is a bit less than the company is claiming, although it's still in the same ball park. Still, he said the industry has plenty of money and that what it pays in taxes is too low. McIntyre believes the oil industry should lose its $4 billion a year in tax breaks and that loopholes for companies in general should be closed. "The oil industry is awash in tax subsidies, subsidies they obviously don't need," he said. "We have a budget deficit." Jeffers said it's unfair to single out the oil industry and take away the tax breaks that other manufacturers enjoy. He noted that while the industry's profits seem large, its profit margins are about average and that it's only being singled out because gas prices are high. If it's the deficit we're concerned about, Jeffers said opening up more areas to oil and gas drilling in this country would do more to add jobs and inject revenue into government coffers than simply upping the tax rate. "Taxes don't create economic activity, they take from it," he said. Jeffers and McIntyre might as well be proxies for the Republican House and Democrat-controlled Senate. In the next few weeks Democrats will push for an end to tax breaks and Republicans will call for more drilling.